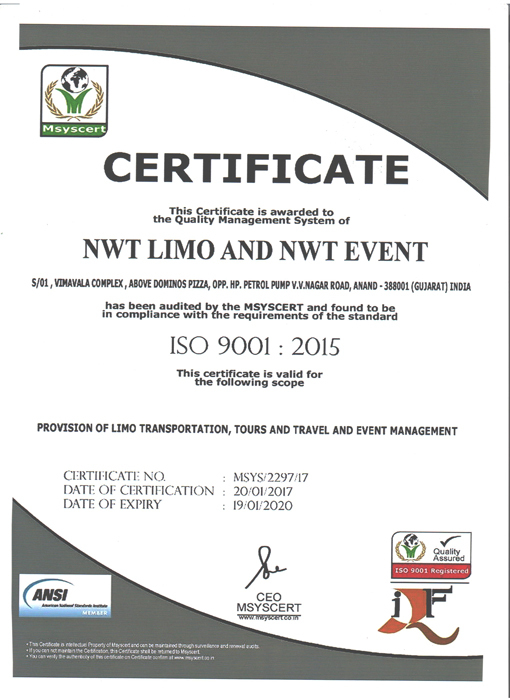 ﻿ Special Occasions Car Rent & Hire, Airport Transfer, Wedding Car Hire, Car Rent for Corporate Events, Sporting Events and Day Trips – NWTlimoint.com. We now have car rental offices covering cities in both Ahmedabad and Anand. Please find us in the following cities: Ahmedabad, Bangalore, Chennai, Goa, Hyderabad, Jaipur, Jodhpur, Kochi, Kolkata, Mumbai, Nasik, Delhi and Pune. On special request, we can deliver to India’s all Airport. Come see the difference Luxury Car Rental has to offer. We extend red carpet service to all our clients as well as a concierge. We are also happy to deliver your car to you anywhere in North India or the South India area. If you’re searching for beautiful but affordable wedding car for your big day, look no further. We are specialists in the provision of wedding day transport and have years of experience within the industry. Plus we can offer you the biggest range of wedding cars in the whole of the India, so regardless of how unusual your request may be, we are certain we can source the perfect wedding car for your special day. Whatever your taste or style, we can offer you a wedding vehicle which ticks all of your boxes. For traditional brides and grooms, take a look at our fleet of classic and vintage wedding cars and we guarantee you won’t be disappointed. What service should you expect from your chauffeur? You may have a specific idea of what you want from your wedding chauffeur. We offer a guaranteed level of service for all wedding occasions. The Wedding Chauffeur - smart and punctual. You can expect a professional and experienced chauffeur driver on your wedding day. The chauffeur will be dressed in a smart suit and tie, with a traditional chauffeur suit and hat available if you prefer. The chauffeur will arrive at least 15 minutes before the appointment time, to help ease any nerves. Whatever car you choose, from the magnificent Mercedes-Benz S Class, a beautiful Bentley or other cars. You can expect a freshly valeted car inside and out along with Free wedding car ribbons. TV/DVD's available on request so you can watch your favorite’s team en route! We are #1 limousine company in India for Special Occasions Events!